Here Cloth of Gold Yarrow is in full bloom and has naturalized itself so that it takes up any empty space it can find, dodging around tall trimmed up Butterfly Bushes and Vitex and poking its head through fencing as though trying to escape to the other side. Indeed, there are little seedlings in the gravelly dirt just beyond the fence from the seeds that fell last fall. Height is not the only difference between Gold Yarrow and the many brilliant colors of Achillea millefoliums; their growing habits and uses are very different also. Gold Yarrows bloom in late spring for about four or five weeks and then are finished for the year while the A. millefoliums bloom from late spring until frost. And, the little White Yarrow is a nice addition to any moonlit walk and the colorful wandering ways of the other A. millefoliums make for perfect spot fillers. Both Achilleas are widely adaptable and can be grown in most parts of the US. Gold Yarrow is a must for dried flower arranging or fresh wreath making. It holds its color very well for a long time. The A. millefoliums tend to fade considerably when dried. Save some Gold Yarrow flower heads for arranging with fall blooming Lion's Tail and Indigo Spires Salvia. To dry these beauties, it is important to pick them before any of the little gold flowers start to turn brown. Cut the stem as long as you like and dry them in a vase upright. Like all dried flowers, it is important to keep them out of direct sunlight. 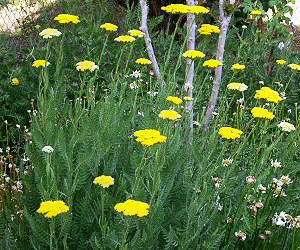 Gold Yarrow is a great addition to our Crafter's Herb Garden Six Pack. Ornamental This item will not be offered this year. If you would like to see it return to our active list, please email us at customerservice@mountainvalleygrowers.com.